Well, it’s that time again! It’s almost January 1st, and you know what that means! It’s time for millions of people to do that cliche thing they call setting New Year’s Resolutions. The title of this post may be slightly misleading; I am not against the practice of setting yearly goals. The word “resolution” in this context is about as disturbing to me as the word “moist.” A shiver goes up my spine when I hear it or read it. It’s a loaded word, full of pressure and intentions that are often not completely realistic or manageable. I’m not saying people shouldn’t set goals for themselves, and the turn of the year is as good of a time as any to start doing something–but the hype of it all is what irks me. All we hear on television are ads related to setting resolutions and trying to sell a product that will help a consumer achieve their chosen task for the year. Businesses take advantage of this need for people to start fresh. I look at it as a psychological sales tactic that prays on a person’s vulnerabilities. 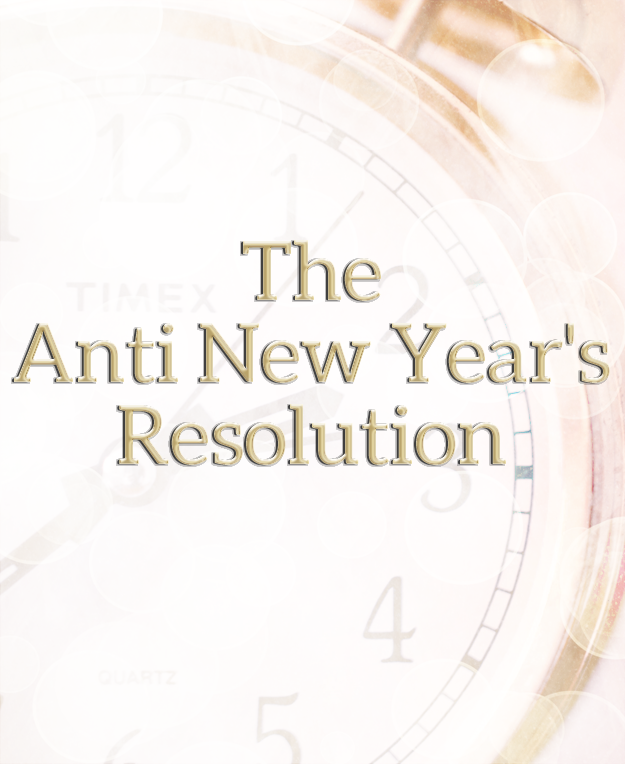 Roughly 8% of resolution setters actually stick to their resolutions. That’s not a very high percentage, is it? I guess the other resolution setters just bought a bunch of stuff they didn’t need by watching those commercials. Yikes. I know, we are only human and it can be really hard to keep working at a long term goal. Like I said, I’m not telling anyone they shouldn’t aspire to do something to improve their life or make themselves happy. But I think as a society, in order to improve the success rate of this yearly fad, we need to approach and think of the resolution thing differently. We need to not just decide to do something; we need to have a better plan of attack. First, let’s get rid of the word “resolution” altogether. Put it out of your mind. Throw it in the trash. Unless you are talking about screen resolution, this word no longer exists. So, what word or words can you use instead? I admit that one might be cheesy, but I had to come up with something fast! You want to feel inspired by what you’re doing and motivated to get to your end result. Does the word “resolution” do that for you? Next, ask yourself if your aspiration is attainable. Does it fit in and work with your lifestyle? For instance, if you work two jobs seven days a week, reading three books a week may not be the most attainable goal. One book may be a better choice, or even backing it down a bit further to a couple of books per month. The important thing is you don’t want to push yourself so hard that you feel stressed out. Burnout will not help you achieve what you want to do. Be realistic and honest with yourself about your abilities and schedule. Last of all you will want to keep track of your progress on a regular basis. If your quest is to save more money, keep a spreadsheet of the amount of money you are saving weekly or monthly. You could even turn the data into a graph to create a more effective visual. Seeing your results unfold before you is a huge motivator. Lists are another great tool. Both are ways you can more easily monitor yourself and keep your momentum going. You might have more than just one objective you intend to take on in the coming year. Try not to let yourself get overwhelmed by them in the coming weeks. When you are thinking about your objectives, take a few minutes for each one and write in a journal or document all the steps you need to take to make these things happen for you. Break them down into smaller bits. It will help to keep you moving forward. Nobody likes to be overwhelmed! I have been contemplating the goals I want to set for myself for the upcoming year, but I haven’t quite planned everything out specifically. My one main objective is to grow my blog. I had a big setback the past couple of weeks with being sick and then it was Christmas. I am trying to get back into the swing of things, but it’s a bit slow going at the moment. Sometimes life happens, and there isn’t much we can do about it. All in all, I’m not too worried about getting the ball rolling again! Otherwise, my buzzword of the upcoming year is “creativity.” I find myself thinking up more projects I want to try, and ideas I want to experiment with. I think 2015 will be an interesting year! What do you aspire to do in 2015? I want to know! Share them in the comments below! Have you ever browsed sites like Match.com and Farmers Only just to kill some time? When I get bored, sometimes I check out profiles on dating websites. Seriously, I do. It’s a weird source of entertainment when nothing else sounds interesting enough. I like to read profiles and think of how this person or that one could market themselves better (let’s face it, a dating profile is like a resume, a marketing tool). So I began coming up with a mental list of things men shouldn’t do in their dating profile so they might get better results (sorry guys, I’m not trying to pick on you). I am not a dating expert, I am only a straight female. I won’t claim to be an authority on getting you more messages, winks, or flirts from other people on whichever site you’re on, however, I am a woman so…isn’t that authority enough? I find myself seeing a lot of the same profile habits in men’s profiles. Gentlemen, while I applaud some of your efforts to create an engaging profile to show the ladies (or other men) who you are, some of you need a little bit of…guidance in this area. You don’t need a Master’s in English, you don’t need to be perfect or try to be someone you’re not, but there needs to be a show of effort. If you don’t show a willingness to be open about yourself, you might get bypassed by someone you might really get along with! So, on to the list of things men shouldn’t do in their dating profile. What this says to me is either you aren’t really serious about meeting people, or you are putting a lot of weight on the value of your profile image(s). Write something! The saying goes, “A picture is worth a thousand words,” but in this case I beg to differ. You need to write about yourself to show others who you are on the inside. Give the other person something to talk about with you. 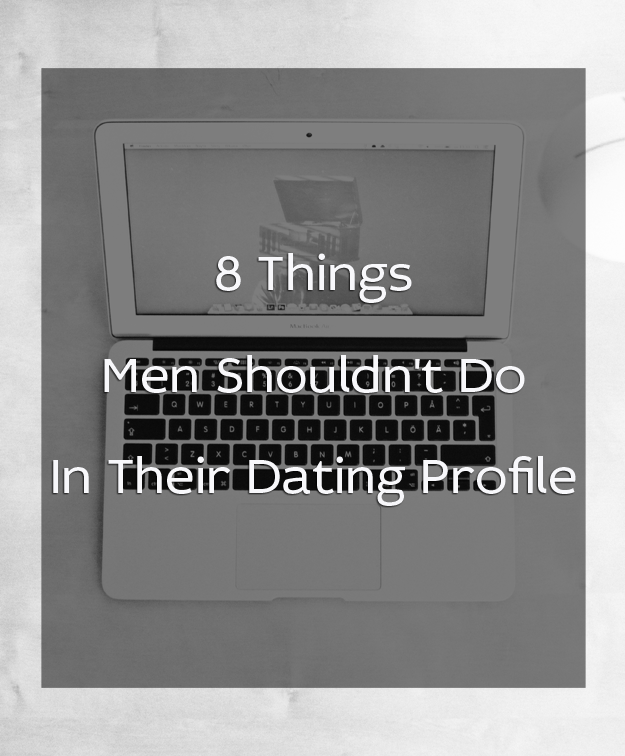 Don’t write a list of everything that went wrong with the last few women (or men) you met or were in contact with on the website. While it’s unfortunate things didn’t work between you and the last few individuals you were in touch with on whatever website you are on, don’t mention them. Yea, you might be irritated by lack of communication by one of them, or the fact you felt the next one played games with you, but when you announce these things on your profile it doesn’t seem very welcoming. It makes others wonder if they will be the next person mentioned on your profile if they try getting to know you and things don’t work out. It also makes it seem as if you hold grudges. You don’t want that, do you? There are more fish in the sea; don’t bother hanging on to negative feelings if things don’t go as far as you’d like them. There will be something positive around the corner. Don’t post a picture of only your truck. Yes, I’m sure you are proud of your Ford F-150 or your Chevy Silverado, but if you are not in the photo I am not sure why it needs to be posted. I don’t gauge someone by what they drive. Do other women do that? Your profile should feature you, not your stuff. Don’t post a picture of only your tractor. See above. I have spotted profiles with tractor photos. Only tractors. That only works if your name is John Deere and I am a farmer. Don’t post photos of animals you have hunted and/or killed. Do I need to explain why dead animals are somewhat of a repellent to the attention your profile gets? Stating in words that you love hunting or fishing is enough. There’s no need for the visuals. Don’t post a bathroom mirror selfie. I feel that the bathroom mirror selfie is showing us a bit too much of your bathroom. Either ask a friend to help you take a photo, or use a self timer feature on your phone camera and set your phone somewhere to take the shot. Don’t post photos of you in a group and not label which guy you are in the picture. There shouldn’t be confusion as to who this profile is for. It’s for you, not for your friends. I don’t believe you and your friends come as a gift set. Don’t post an old picture of you and an ex. It doesn’t matter if you cover her face, cut her out, whatever. Just don’t do it. It kind of sends a signal you might not be over your ex if you still have pictures of her handy. Also, it’s probably a good idea to not post a photo of you and any person who looks like they could be your partner. Try to be creative with your dating profile and what it says about you. Give what you feel is an accurate reflection of yourself. If you need help deciding what to write, ask someone who knows you well for input. I can only speak from my own female perspective, but I think it’s important to describe your interests and personal qualities, as well as what you are looking for in another person. Be descriptive and honest. Hopefully, these tips will get your inbox more attention! Good luck on writing or updating your dating profiles, fellas! Do you have any “don’ts” you would like to recommend? Leave them in the comments! I really like the color black. I love colors too, but for a long time when I would shop I would end up buying a lot of black things. It’s been a few years since I’ve consciously made an effort to refrain from buying so much black, but a girl just can’t help shopping for stuff in a color that will go with any other color she chooses. When you add a pop of color to anything black, the combination gives the vibrant colors that much more emphasis. This outfit is something I would wear to a holiday party. 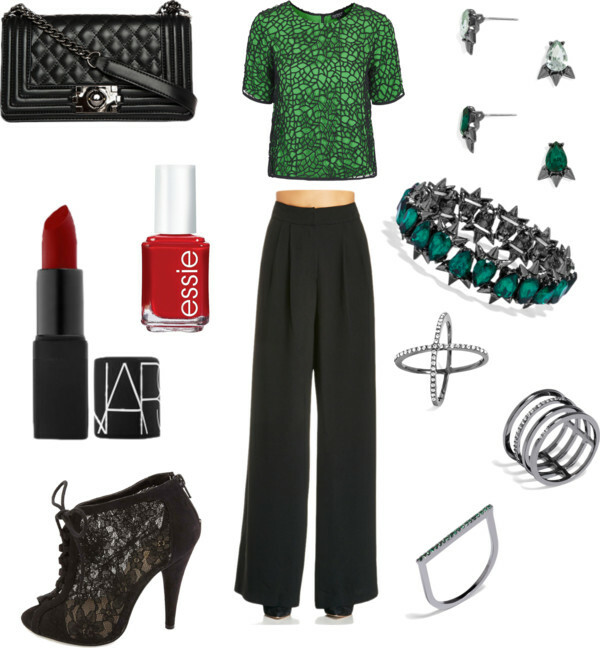 The emerald top is a great focal piece with its black crochet texture. The jewelry accents the top with its emerald colored gemstones in the earrings and bracelet. The rings are more simplistic, with a hint of bling. Then, to top off the color, wear a true and vibrant red nail and lip! This ensemble kind of reminds me of something Katherine Hepburn may have worn, but modernized. She liked long trousers. A vintage inspired, 1940’s hairstyle would go well with this look. My mom and I took a little trip to World Market the other day. We always get sucked in to that store because of all the international goods. My favorite aisles are the food aisles of course, because they are fully loaded with goodies. 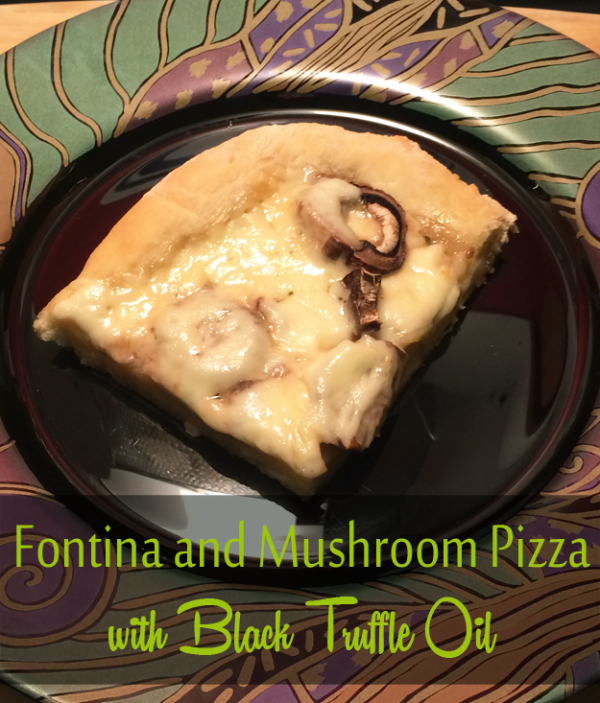 This time, the treasure that I picked up was a bottle of Sabatino Tartufi Black Truffle Oil! I have wanted to try cooking with this for a long time–since I tried my very first truffle fry! Now I get my chance to use this gourmet ingredient! Let me just say right now, truffle oil doesn’t come out of a truffle. I have read some information online regarding truffle oil and there are two ways it can be made: olive oil infused with real truffles, and olive oil perfumed with a chemical to make it smell like truffles. The former is better than the latter because the infused oil has the truffle flavor (and no weird chemicals). I think the fact that some brands of the oil are just basically scented with no taste value gives truffle oil a bad rap. I got the impression there are quite a few chefs in the world who simply hate the stuff. Maybe it’s because truffle oil has been overused, or because there is a good percentage of it that isn’t the quality stuff. I don’t really know. However, in my area it hasn’t been overused so I won’t be snubbing it anytime soon! Truffle oil has an earthy, pungent aroma. I thought it smelled slightly of garlic too, but maybe that is just my nose. It smells excellent! I knew it was going to add an extra special element to my pizza. I was definitely excited to use it. It is also worth mentioning that there is black truffle oil or white truffle oil. The information I have read suggests that certain foods taste better with one kind of truffle oil over the other, but I think it might be something a person needs to determine for themselves. 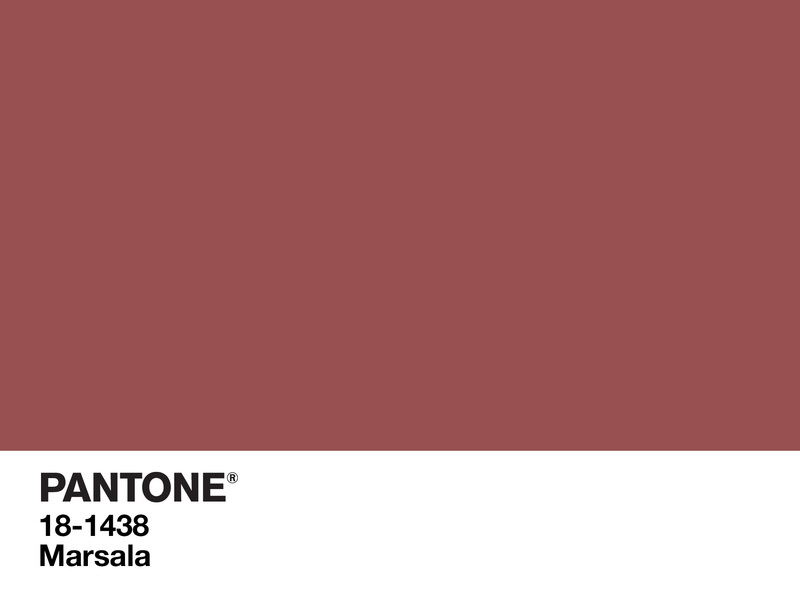 The Pantone Color of the Year for 2015 has been announced, and the color is….MARSALA! Yea, that was my reaction too. What color is Marsala anyway? Actually, some of you may be asking what the hell Pantone is. If you aren’t in some kind of art or design field, or if you aren’t a fashion enthusiast, you maybe haven’t heard of it. Think of Pantone Inc. as the color gods of the universe. The company is best known for the Pantone Matching System, which is a cohesive set of color guides used in the printing, paint, plastic, interior and fashion design industries to color match whatever colors they are using. The colors and their numbers, are held within books of Pantone cards. Basically, they are similar to swatches of paint you’d find at your local hardware store (but not free). So, if a company uses a certain type of red on their logo, they give the number of that shade of red to the designer who is making them a tradeshow banner. The designer can find that exact color in the Adobe Photoshop software’s color library, and use it in the banner. Pantone began choosing colors of the year back in 2000. Cerulean, a light toned blue was the “it” color that back then. Pantone hosts a secret meeting in Europe twice a year for two days to determine these colors that will dictate the upcoming year’s trends in consumer driven industries. It sounds like there is some serious debating going on among the color standards experts who take part in this. I wonder why they chose Marsala. The actual swatch doesn’t really capture my attention. Then again, it is a flat wash of color on a screen or piece of paper. Objects give color dimension and depth. It’s like…a muddied up plummy red…or reddish plum…like a bruise. I really don’t know how to describe it, but the fancy images of models and settings on the Pantone website made it look good. Like I said though, it’s used in a dimensional way and varies in lightness, darkness, and shade. I love it when the Color of the Year is revealed, but I love it more when the seasonal color sets are announced. They make me feel creative. I enjoy trying to use them. For this Fantasy Wardrobe Friday, I did a one brand collection of items from Modcloth. I found a bunch of cute things that were in hues of Marsala! It’s Game of Thrones Night on HBO Now! Visit T (Rangeelichick)'s profile on Pinterest.